Hazards associated with flooding can be divided into primary hazards that occur due to contact with water, secondary effects that occur because of the flooding, such as disruption of services, health impacts such as famine and disease, and tertiary effects such as changes in the position of river channels. Throughout the last century flooding has been one of the most costly disasters in terms of both property damage and human casualties. Major floods in China, for example, killed about 2 million people in 1887, nearly 4 million in 1931, and about 1 million in 1938 The 1993 flood on the upper Mississippi River and Midwest killed only 47 people, but the U.S. Army Corps of Engineers estimates the total economic loss at between 15 and 20 billion dollars. Again, the primary effects of floods are those due to direct contact with the flood waters. As seen in the video last lecture, water velocities tend to be high in floods. As discharge increases velocity increases. With higher velocities, streams are able to transport larger particles as suspended load. Such large particles include not only rocks and sediment, but, during a flood, could include such large objects as automobiles, houses and bridges. Massive amounts of erosion can be accomplished by flood waters. Such erosion can undermine bridge structures, levees, and buildings causing their collapse. Water entering human built structures cause water damage. Even with minor flooding of homes, furniture is ruined, floors and walls are damaged, and anything that comes in contact with the water is likely to be damaged or lost. Flooding of automobiles usually results in damage that cannot easily be repaired. The high velocity of flood waters allows the water to carry more sediment as suspended load. When the flood waters retreat, velocity is generally much lower and sediment is deposited. After retreat of the floodwaters everything is usually covered with a thick layer of stream deposited mud, including the interior of buildings. Flooding of farmland usually results in crop loss. Livestock, pets, and other animals are often carried away and drown. Humans that get caught in the high velocity flood waters are often drowned by the water. Floodwaters can concentrate garbage, debris, and toxic pollutants that can cause the secondary effects of health hazards. Drinking water supplies may become polluted, especially if sewerage treatment plants are flooded. This may result in disease and other health effects, especially in under developed countries. Gas and electrical service may be disrupted. Transportation systems may be disrupted, resulting in shortages of food and clean-up supplies. In under developed countries food shortages often lead to starvation. Location of river channels may change as the result of flooding, new channels develop, leaving the old channels dry. Sediment deposited by flooding may destroy farm land (although silt deposited by floodwaters could also help to increase agricultural productivity). Jobs may be lost due to the disruption of services, destruction of business, etc. (although jobs may be gained in the construction industry to help rebuild or repair flood damage). Corruption may result from misuse of relief funds. Floods can be such devastating disasters that anyone can be affected at almost anytime. As we have seen, when water falls on the surface of the Earth, it has to go somewhere. In order to reduce the risk due to floods, three main approaches are taken to flood prediction. Statistical studies can be undertaken to attempt to determine the probability and frequency of high discharges of streams that cause flooding. Floods can be modeled and maps can be made to determine the extent of possible flooding when it occurs in the future. And, since the main causes of flooding are abnormal amounts of rainfall and sudden thawing of snow or ice, storms and snow levels can be monitored to provide short-term flood prediction. In your homework exercise you will see how flood frequencies can be determined for any given stream if data is available for discharge of the stream over an extended period of time. Such data allows statistical analysis to determine how often a given discharge or stage of a river is expected. From this analysis a recurrence interval can be determined and a probability calculated for the likelihood of a given discharge in the stream for any year. The data needed to perform this analysis are the yearly maximum discharge of a stream from one gaging station over a long enough period of time. In order to determine the recurrence interval, the yearly discharge values are first ranked. Each discharge is associated with a rank, m, with m = 1 given to the maximum discharge over the years of record, m = 2 given to the second highest discharge, m = 3 given to the third highest discharge, etc. The smallest discharge will receive a rank equal to the number of years over which there is a record, n. Thus, the discharge with the smallest value will have m = n.
A graph is then made plotting discharge for each year of the record versus recurrence interval. The graph usually plots recurrence interval on a logarithmic scale. An example of such a plot is shown here for the Red River of the North gaging station at Fargo, North Dakota. A best-fit line is then drawn through the data points. From the best-fit line, one can determine the discharge associated with the a flood with a recurrence interval of say 10 years. This would be called the 10-year flood. For the data on the Red River, above, the discharge associated with the 10-year flood is about 12,000 cubic feet per second. Similarly the discharge associated with a flood with a recurrence interval of 50 years (the 50-year flood) would have a discharge of about 21,000 cubic feet per second. The 100-year flood would have a discharge of about 25,000 cubic feet per second. Note that for the Red River data, shown above, the April 18, 1997 flood had a discharge of 30,000 ft3/sec, which is equivalent to a 250-year flood. Also note that a flood that reached a similar stage occurred on the Red River in Fargo in the year 1887, only 110 years before. Furthermore, the Red River reached a bit more than 30,000 ft3/sec in 2009. Does this make the statistical analysis unreliable? The answer is no. As we shall see, it is possible to have two 100-year floods occurring 100 years apart, 50 years apart, or even 2 in the same year. The value, Pe, is called the annual exceedence probability. For example, a discharge equal to that of a 10-year flood would have an annual exceedence probability of 1/10 = 0.1 or 10%. 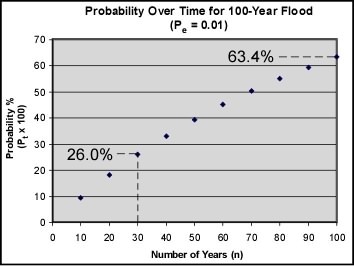 This would say that in any given year, the probability that a flood with a discharge equal to or greater than that of a 10 year flood would be 0.1 or 10%. Similarly, the probability of a flood with discharge exceeding the 100 year flood in any given year would be 1/100 = 0.01, or 1%. Note that such probabilities are the same for every year. So, for example, the probability that discharge of the Red River at Fargo, North Dakota will exceed 25,000 ft3/sec (the discharge of the 100-year flood) this year or any other year would 1%. You can think of this in the same way you would think about rolling dice. The probability on any roll that you will end up with a six, rolling only on die, is 1 in 6 or 16.67%. Each time you roll that one die the probability is the same, although you know that it is possible to roll two or three sixes in a row. Thus, it is important to remember that even though a 250-year flood occurred in Fargo in 1997 and 2009, there is still a 0.4% probability that such a flood, or one of even greater magnitude, will occur this year. Despite the fact that the 100 year flood has only a 1% chance of occurring each year, the probabilities do accumulate over time. where Pt is the probability of occurrence over the entire time period, n, and Pe is the probability of occurrence in any year. The probability of a 100 year flood occurring in 30 years (the lifetime of the average home mortgage) is 26.0%! Food hazard mapping is used to determine the areas susceptible to flooding when discharge of a stream exceeds the bank-full stage. Using historical data on river stages and discharge of previous floods, along with topographic data, maps can be constructed to show areas expected to be covered with floodwaters for various discharges or stages. In constructing such maps aerial photographs and satellite images of prior floods are studied to help to determine the areas that would be covered. The illustration above shows a possible hazard map based on estimated discharges or river stages for a hypothetical 10-year flood, 50-year flood, and 100-year flood. In addition, scale models are often constructed of areas prone to flooding. Such models only work if they are kept up to date with current flood prevention structures and drainage modifications. If factors such as amount of rainfall, degree of ground saturation, degree of permeable soil, and amount of vegetation can be determined, then these can be correlated to give short-term prediction, in this case called a forecast, of possible floods. If a forecast is issued, then a flood warning can be communicated to warn the public about the possible extent of the flood, and to give people time to move out of the area. Such forecasts are very useful for flooding that has a long lag time between the storm and the peak discharge. Flash floods, which characteristically have short lag times, are more problematical. Thus, in some areas known to be susceptible to flash floods, a flash flood warning is often issued any time heavy rainfall is expected because there is always the chance of a flash food accompanying heavy rainfall. Humans can modify the landscape in many ways. Sometimes humans attempt to modify drainage systems to prevent flooding, but sometimes these efforts have adverse effects and actually help to cause flooding in other areas. Any modification of the landscape has the potential to cause changes in the drainage system, and such changes can have severe consequences. Humans often decide that a stream should flow along a specified path for such reasons as flood control, enhancement of drainage, control of erosion, increasing access to the floodplain for development, or improvement of the appearance of the channel. Such channel modifications involve measures such as the straightening the channel, deepening or widening the channel, clearing vegetation from the banks, or lining the channel with concrete. These modifications are referred to as channelization. In order to control floods, channel modification should involve increasing the channel cross-sectional area, so that higher discharge will not increase the stage of the river. Straighter channels also allow higher velocity flow and, enable the stream to drain faster when discharge increases. Lining the channel with concrete provides a smoother surface over which the water can flow, thereby reducing friction and also increasing the velocity of the stream. While channelization for flood control may reduce the incidence of flooding in the channelized area, it often results in more severe flooding both upstream and downstream from the channelized area. Channelization can also interfere with the natural habitat of the stream system and decrease the aesthetic value of the stream. Channelization, or any other modification of a stream system, changes the validity of all historic data collected over the years on that stream. During flooding of the Mississippi River in 1973 and 1993 water levels rose to higher levels than expected from the statistical data, because modification of the stream had made the data invalid. The 1973 flood caused damage and rose to levels that might be expected from a 200-year flood, even though discharge was only at a level predicted for a 30-year flood. Thus, it appears that modifications of the drainage system had an adverse effect. Channelization - As noted above, most channelization is undertaken to reduce flood hazards. But, channelization is also undertaken to allow development on the floodplain. If the channelization results in decreasing the cross-sectional area of the stream, as in the example above, then the same discharge that may not have produced flooding prior to channelization, may overflow the banks and cause extensive flooding after channelization. Subsidence - As will be discussed in a later lecture, subsidence often results in developed areas due to compaction of the sediment, both due to the increasing weight of structures and hydrocompaction associated with the lowering of the water table. Any time the elevation of an area is lowered, it becomes subject to collection of more water, and in severe cases, could drastically change the drainage pattern. Storm Sewers - In order to collect run off from streets, parking lots, and buildings, all of which block the infiltration of water into the soil, storm sewers are installed to provide underground drainage of the surface. While this may prevent local flooding of streets, it moves water more rapidly to the major stream systems and thus decreases the lag time and increases the peak discharge of the streams collecting the runoff from the storm sewers. Reduction of infiltration - Any time the surface materials of the Earth are covered with impermeable materials like concrete, asphalt, or buildings, the infiltration of water into the soil is prevented. Urbanization tends to reduce infiltration, and thus water must collect in storm sewers and eventually in the main drainage systems. Thus, extensive urbanization also decreases the lag time and increases the peak discharge even further. Urbanization can therefore lead to a higher incidence of flash floods. Mitigation of flood hazards can be attempted in two main ways: An engineering approach, to control flooding, and a regulatory approach designed to decrease vulnerability to flooding. Channel modifications - As discussed above, channelization. can enlarge cross-sectional area and thus create a situation where a higher stage is necessary before flooding. In other words by enlarging the cross-sectional area, higher discharge can be held within the channel. Channelization also increases water velocity, and thus reduces drainage time. Dams - Dams can be used to hold water back so that discharge downstream can be regulated at a desired rate. Human constructed dams have spillways that can be opened to reduce the level of water in the reservoir behind the dam. Thus, the water level can be lowered prior to a heavy rain, and more water can be trapped in the reservoir and released later at a controlled discharge. Retention ponds - Retention ponds serve a similar purpose to dams. Water can be trapped in a retention pond and then released at a controlled discharge to prevent flooding downstream. Levees, Dikes, and Floodwalls - These are structures built along side the channel to increase the stage at which the stream floods. Some controversy has developed concerning the use of such structures. For example, during the 1993 floods on the upper Mississippi River, the city of St. Louis was prevented from flooding by closing the floodwalls. This essentially narrowed the river channel as it passed St. Louis and caused slowing of the River. Because of the restricted channel, flood waters were forced to flow into areas both upstream and downstream from St. Louis, perhaps increasing the damage in the these areas. Floodways - Floodways are areas that can be built to provide an outlet to a stream and allow it flood into an area that has been designated as a floodway. Floodways are areas where no construction is allowed, and where the land is used for agricultural or recreational purposes when there is no threat of a flood, but which provide an outlet for flood waters during periods of high discharge. The Bonnet Carrie Spillway west of New Orleans is such a floodway. During low stages of the Mississippi River the land between the River and Lake Pontchartrain is used for recreational purposes - hunting, fishing, and dirt bike riding for example. During high stages of the River when there is a potential for the River to rise to flood stage in New Orleans, the spillway is opened so that water drains into Lake Pontchartrain. This lowers the level of water in the Mississippi and reduces the possibility of a levee break or water overtopping the levee. Floodplain zoning - Laws can be passed that restrict construction and habitation of floodplains. Instead floodplains can be zoned for agricultural use, recreation, or other uses wherein lives and property are not endangered when (note that I did not use the word if) flood waters re-occupy the floodplain. Floodplain building codes - Structures that are allowed within the floodplain could be restricted those that can withstand the high velocity of flood waters and are high enough off the ground to reduce risk of contact with water. Floodplain buyout programs - In areas that have been recently flooded, it may be more cost effective for the government, which usually pays for flood damage either through subsidized flood insurance or direct disaster relief, to buy the rights to the land rather than pay the cost of reconstruction and then have to pay again the next time the river floods. Mortgage limitations - Lending institutions could refuse to give loans to buy or construct dwellings or businesses in flood prone areas. List the primary, secondary, and tertiary effects of flooding. Explain what is meant by the "100 year flood". Be able to interpret flood frequency diagrams like the one given for Fargo, North Dakota or the one you constructed in your homework. As an example you should be able to answer questions like the following for any flood frequency diagram.- (a) approximately how many times has the Red River exceeded a discharge of 33 feet between 1882 and 2009? (b) what is the discharge and stage for the 100 year flood on the Red River? (c) What is the probability that the Red River attains a discharge of 5,000 ft3/sec each year? 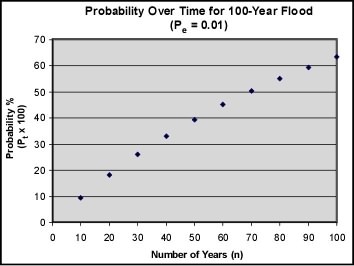 What is the probability that the 100 year flood will occur in any given year? How does human development affect flood hazards? What engineering approaches are available to reduce the risk of flooding? Besides engineering solutions, what other steps can be taken to reduce vulnerability to flooding?